It’s graduation month! What flowers are you going to give the graduate in your life? Will they be fun flowers that will induce a smile? Perhaps formal blooms that will set the stage for a serious future? There are so many flowers that are perfect for giving for a graduation. Consider some of the following when you go to buy your bouquet or arrangement. Carnations are beautiful for gifting on a celebratory occasion, because their shape and colors seem to lift spirits even higher than they might already be. 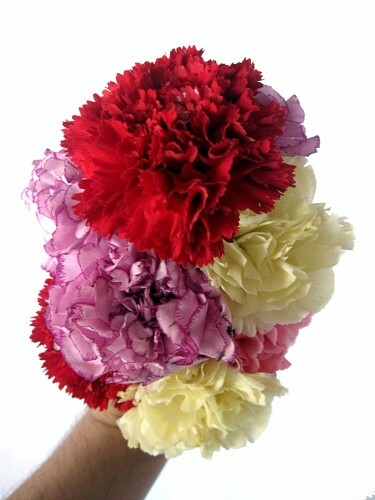 Carnations are playful blooms that look pretty, and festive, in casual bunches of just their own kind or mixed with other flowers. Choose them in white, red, pink, and many other colors. They last for a long time, so your giftee will get extended pleasure from them. Orchids make a great congratulatory floral gift, because they offer a feeling of profound love and pride. For a special and unusual choice, opt for a green orchid or two. Common colors of orchids – like purple and white – are also ideal as they can offer stability that might help a graduate as he or she begins a new life. Roses are always appropriate flowers to give. And, on graduation day, they may be the ultimate gift of love you can give to a son or daughter who is graduating (aside from your own heartfelt thoughts and support). When choosing roses, there really is no hard fast rule. You can go with pink, yellow, white, orange, and even red. Roses represent adoration, caring, love, protection, peace, and many other thoughts – and gestures – that a graduate would surely want with them in a new life chapter. As you pick flowers for a graduation, consider whether you want subdued and tranquil blooms (and colors) or if you’d rather have bold (and bright) blossoms to offer. The best flowers for you to give for graduation day are the ones that express your sincere feelings for that special person in your life.